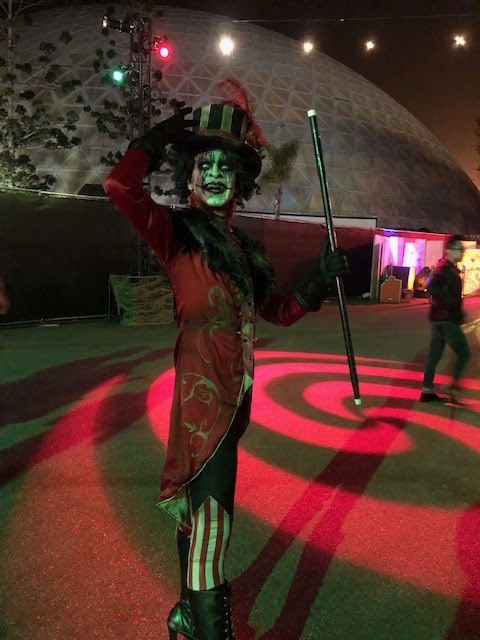 Queen Mary's Dark Harbor returns with new maze layouts and the same familiar mazes. The event starts with a charming, hilarious opening ceremony between the Captain and the Ringmaster warming up the crowd and heckling each other. On to the mazes. Thematically, this is my favorite maze. Chef served people to the ship and a mob burned him alive in his oven. That's deliciously dark. 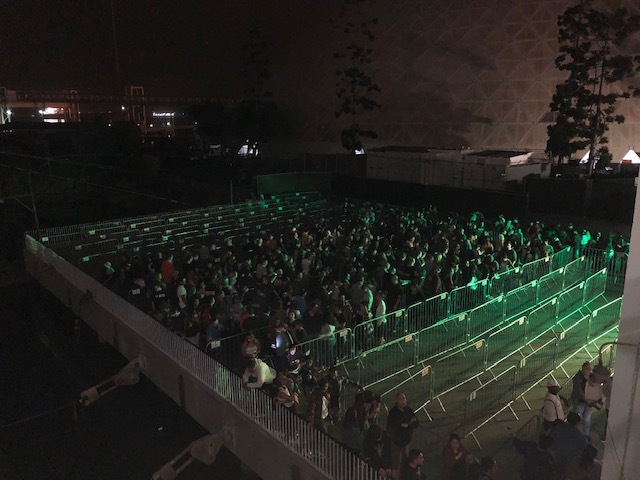 The maze itself wasn't as good as last year. The scares felt a little too spaced out, so I was able to get comfortable in between. The atmosphere wasn't consistent throughout the maze and it got a little repetitive with cooks jumping out all the time.. The soundtrack is incredibly eerie. Some of the tableaux were well done, especially the room with the skin hanging up like laundry. I also love that we had to crawl through a tunnel and end up literally in Chef's oven. B340 is home to Samuel the Savage, one of the most infamous criminals in Queen Mary's history. The maze has some elements I love like offputting music, a bridge that feels like it falls out from under you, creepy ghosts with tortured faces, and the room with a bright light right at the top, effectively blinding you to anything else. The murder scene and subsequent portrayal of Samuel's victims tie the story into the maze the best. 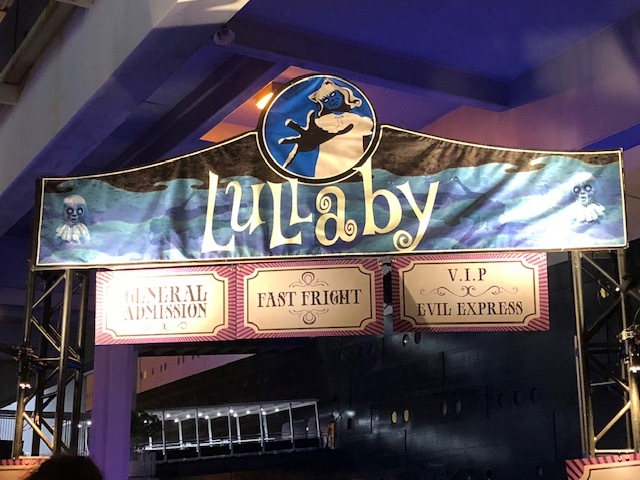 Lullaby is my least favorite maze. It's about a little girl named Mary who haunts the ship after drowning in the pool in the 50's. Unfortunately, many of the Mary's throughout the maze think screaming in people's ears is scary. It isn't; it's just painful and reminds me I should bring earplugs to events like these. I loved the opening tableau of her dollhouse, crib, and funeral card blown up large along with the pictures of her leading to that room with neon lights to highlight them. The toys and childish things being made scary was also well done. Overall, this was the most disappointing maze. Deadrise is one of my favorite mazes. It has a military theme and the Grey Ghosts (who look an awful lot like zombies to me). What's not to like? 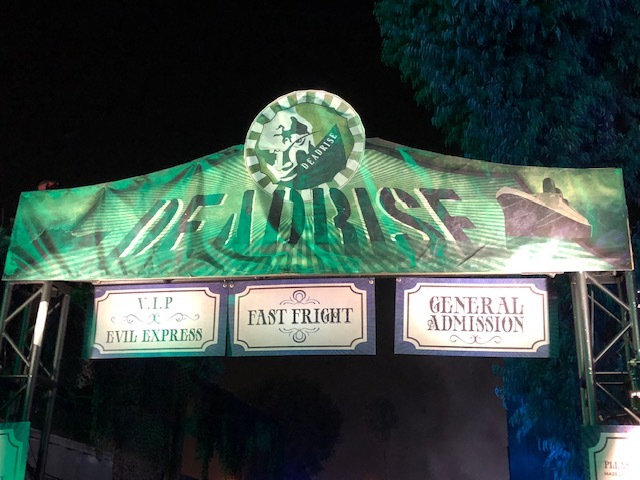 Much of the sets are made of storage containers, which allows scare actors to startle us by slapping the sides or running metal objects along them. There were multiple alternate routes that led to boot camp style obstacles like a small rope ladder and a pole to slide down on the other side. No one but my boyfriend and me went through those, but it added a super fun element that also isn't required for any who might get hurt. The end always has a surprising scare that's missing from the other mazes. Circus is home to old fashioned sideshow freaks and typical circus attractions like a mirror maze, funhouse mirrors, and a ball pit. The moving tunnel right at the opening is both disorienting and charming along with the mirror maze. Right afterwards, the floors metal plates shift as you walk on them, making you stumble a bit walking in. These things are so unique to this attraction and feels true to the circus theme. This one feels the most successful at conveying its story. Intrepid is my other favorite maze. 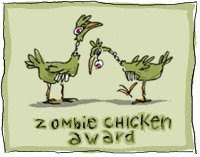 It combines Scottish people and settings with a cemetery and creepy plague doctors. The room half filled with mist and laser lights over the top of it is brilliant. People hide in the mist and pop up or reach out with their hands through the mist. This maze last year was the first time I ever saw it done and other attractions have now copied it. The elements don't seem to be quite related, but they work together beautifully. 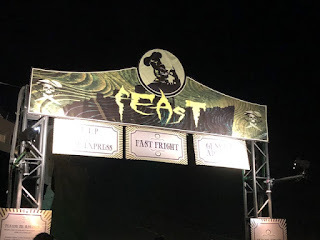 Overall, the mazes are enjoyable and each has at least one impressive set piece that wowed me. I wish the stories behind these mazes were better expressed at the park instead of just put up online. 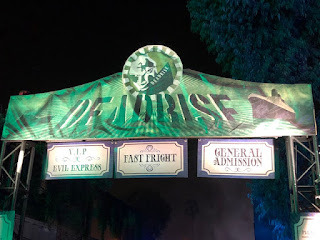 The mythology and origins of these stories makes them special and sets this attraction apart from other horror attractions. 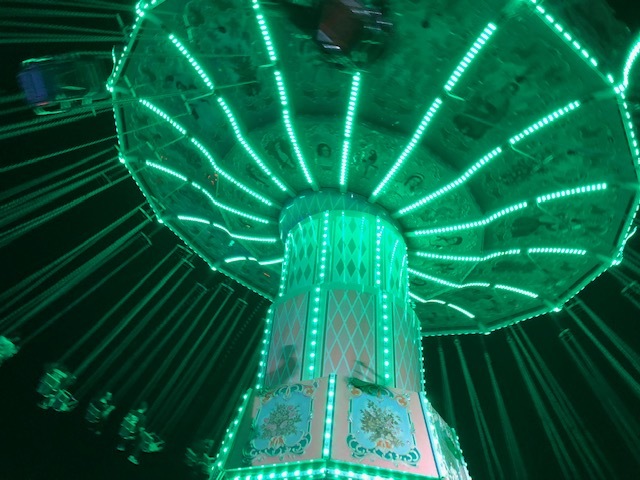 The Sinister Swings were super fun. 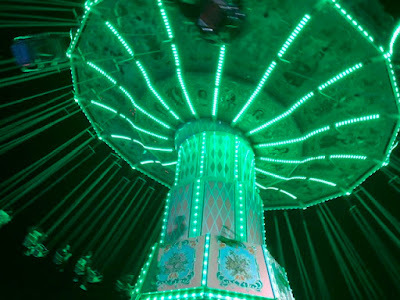 The ride is from Michael Jackson's Neverland Ranch, which is pretty creepy. Even though I was a tad scared, the ride is completely safe and solid. Very enjoyable. There are a variety of acts that either walk around the park to entertain or perform at a stage accompanied by music. I was a band and a gymnast, but the stages were often empty. I love this aspect of the attraction and I was eager to see more local acts. I didn't go to any of the bars, but there were a ton around in mazes and standing alone. I like that this event is unapologetically for adults and makes booze readily available. 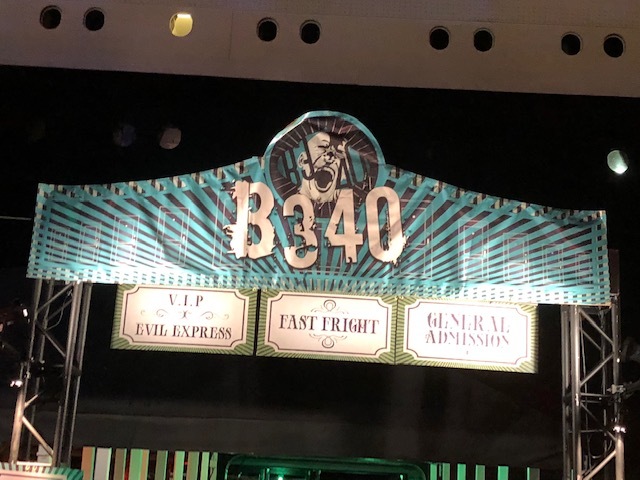 The 4D Panic Experience is a fun short experience. It's a film in 3D with external effects like water spray and something to touch your feet. The story has a monster chasing you through a dilapidated house, all in CGI. The effects are about as a good as a computer game. The scary level would be fine for around a middle schooler. 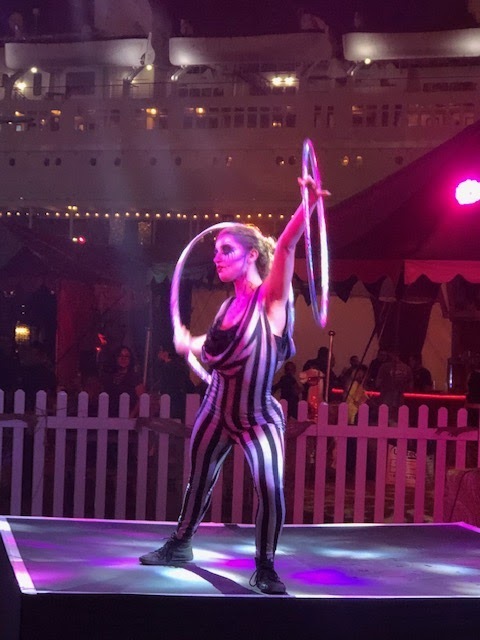 Overall, Queen Mary's Dark Harbor entertains, chills, and proves itself as competition for other local events such as Universal Studios and Knott's Berry Farm. It was good last year and proves consistent. The main characters are commited to their act and fun to interact with. I highly recommend the VIP experience to avoid time consuming lines like the picture above. 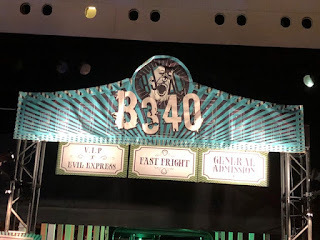 I didn't wait more than 10 minutes for any attraction except the 4D Panic Experience. I look forward to future years with improvements and changes at the Queen Mary for Halloween.